During the three-day conference (12.-14. September 2018) – titled “Beyond services towards justice” – nearly 90 participants discussed the contribution that theology can bring to the development of social justice and Diaconia from both national and global perspectives. The conference also looked at the themes of the economics of solidarity, welfare and gender as well as diaconal science in current academic curricula. The event was hosted by Diakonie Deutschland in Berlin and officially opened with greetings by its president Ulrich Lilie. The opening lecture was given by the WCC Associate General Secretary for Public Witness & Diaconia Dr. Isabel Phiri. During three days, several keynote lectures, as well as four rounds of workshops and paper sessions sparked a fruitful exchange among participants. 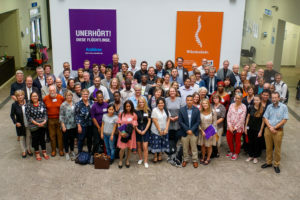 Besides the academic sessions, the participants had the opportunity to attend a dinner at Berlin City Mission and a conference dinner organised by Diakonie Deutschland, with a speech on the challenges represented by the digital revolution for diaconal organisations advocating for social justice. The 7th ReDi Conference also included the award ceremony of the 1st Anders Bäckström Prize for excellent Master theses in Diaconal studies, as well as the ReDi General Meeting. Please have a look at the full conference programme, together with the list of workshops and paper sessions, and a selection of photographs. The next ReDi Conference will be held in September 2020 in Norway.